Good morning! Have your co-workers gotten on board yet? Tell them to follow along by signing up here. Huge NBA game: On the final day of the regular season, the Hornets need a win against the Magic (8 pm ET, ESPN) to make the playoffs. Otherwise, the Pistons get the final spot. On a night in which the NBA honored two all-time greats in Dwyane Wade and Dirk Nowitzki, Magic Johnson stole the show when he decided he'd rather just be Magic Johnson. What's happening: In a move that reportedly caught even those closest to him off guard, Johnson announced that he was stepping down from his position as the Lakers' president of basketball operations just over two years after taking the job. In an impromptu press conference ahead of the Lakers' final game of the season, Johnson spoke about his desire to go back to being a "statesman of the game," unshackled by tampering rules and free to tweet at and mentor whomever he wants. He also talked about how much he hated the idea of having to fire embattled coach Luke Walton. Now that Johnson's gone, Walton will presumably stay with the team (for now). "End of the day, Magic claims he has too much love for [team owner] Jeanie Buss to hurt someone she loves in Luke Walton. A high-stakes basketball version of the Gift of the Magi. 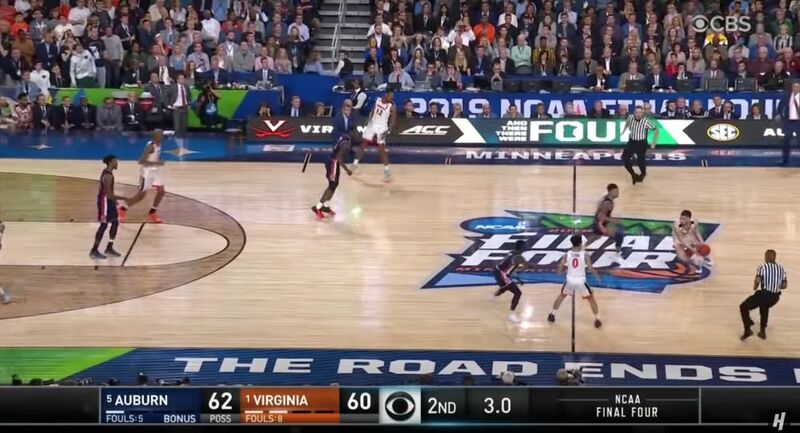 Stunning," tweeted ESPN's Dave McMenamin. Johnson: "I was happier when I wasn't the president. ... The fines and the tampering and the this and the that ... I don't like that. I like to be free." 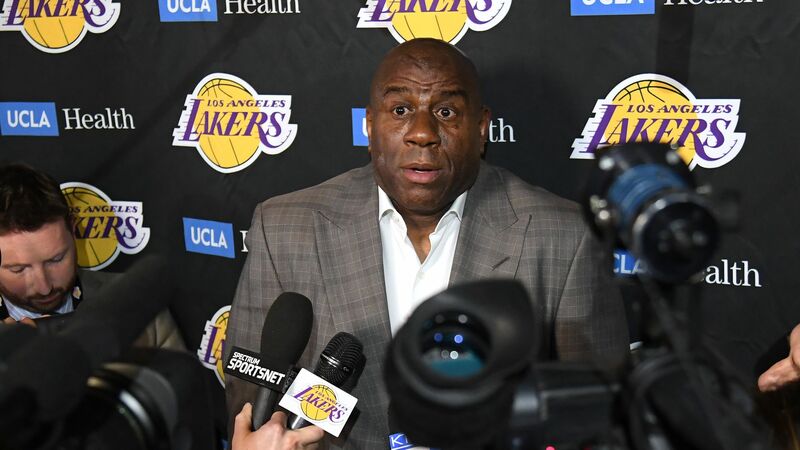 ESPN's Dan Le Batard: "Magic Johnson has grown very comfortable at the business of being Magic Johnson, [which] doesn't require a lot of work at this point. ... Being the head of a non-playoff team that requires architecture is too much 'hands dirty' for a legend of his stature to be dealing with anymore." The big picture: Leaving like this — with the Lakers just months away from one of the important summers in franchise history and with the Walton situation still unresolved — feels a lot like quitting a job that got too hard. Not a great look for Magic (though I support his decision, as I would support anyone's decision when their only goal is to be happy), and not a great look for the Lakers, either. Silver lining: The Lakers don't need Magic, they need a plan. So perhaps him leaving is actually a good thing for this franchise. Plus, now that he's a regular member of society, Johnson can try to convince every superstar in the world to sign with the Lakers without the NBA fining him. What's next: Make Kobe the coach, GM and team president. Let's do this thing. JK, but not really. The New Jersey Devils won the 2019 NHL draft lottery last night after entering with the third-best odds. It's the second lottery win in three years for the Devils, who selected center Nico Hischier with the top pick in 2017. Why it matters: The prize of this year's draft is 17-year-old Jack Hughes, who the Devils will almost certainly make the eighth American-born player to be taken with the No. 1 pick. Hughes is set to make history as the first U.S. National Team Development Program player to jump straight to the NHL. During his two years in the program, he rewrote the record books, blowing past the likes of Auston Matthews, Jack Eichel, Patrick Kane and Phil Kessel. Hughes was born in Orlando, Florida, and grew up in Toronto surrounded by hockey talent. His older brother, Quinn, was drafted seventh overall by the Canucks last year, his younger brother, Luke, is a rising star, and both of his parents played in college. Strengths/weaknesses: His skating and vision are elite, so he projects to be a top-notch playmaker right away. The biggest concern would be his size (5-foot-10) and physical strength. 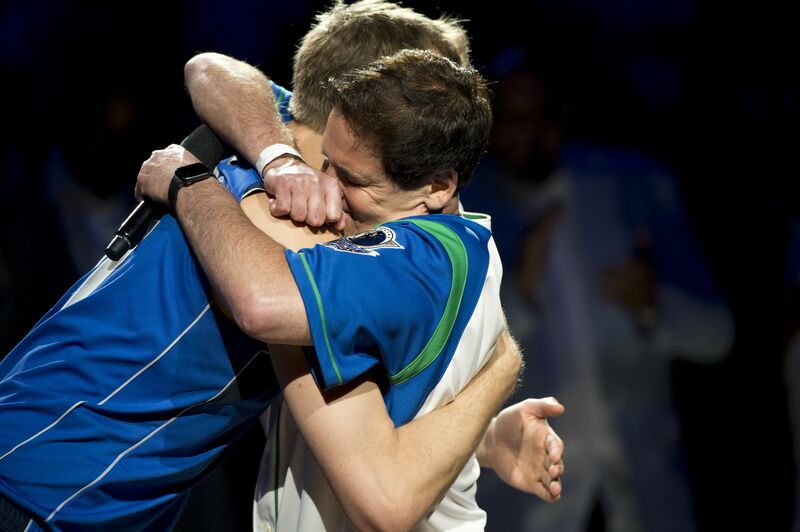 "You can spend the rest of your hockey career trying to find another player like Jack. He steps on the ice every night wanting to be the best player in the game." P.S. ... Speaking of teams defying the odds, the Rangers jumped up from No. 6 to snag the second overall pick, and the Blackhawks made an even more dramatic move, going from No. 12 all the way to No. 3. Full lottery order: 1. Devils; 2. Rangers; 3. Blackhawks; 4. Avalanche (from Senators); 5. Kings; 6. Red Wings; 7. Sabres; 8. Oilers; 9. Ducks; 10. Canucks; 11. Flyers; 12. Wild; 13. Panthers; 14. Coyotes; 15. Canadiens. 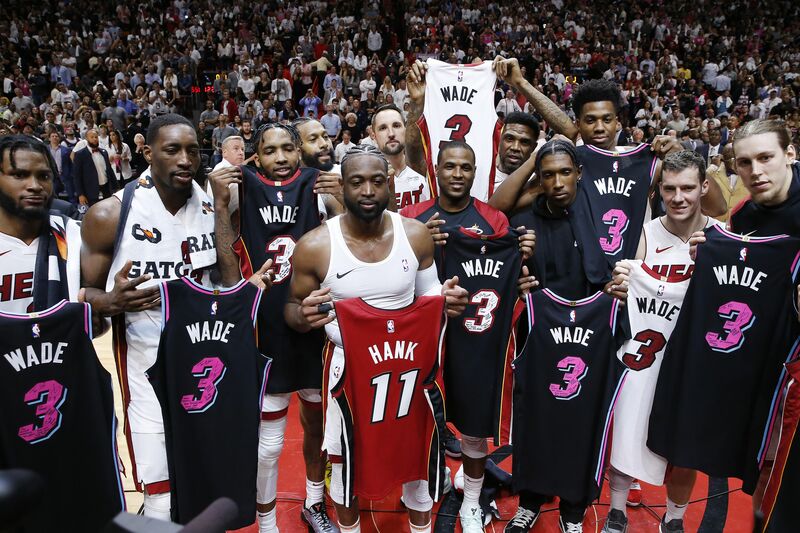 Above: Dwyane Wade exchanged jerseys with the entire Miami Heat team after he dropped 30 in the final home game of his career last night. What a career. What a human being. I love that guy, man. Watch: This D-Wade ad obliterated me and will almost certainly make you cry. 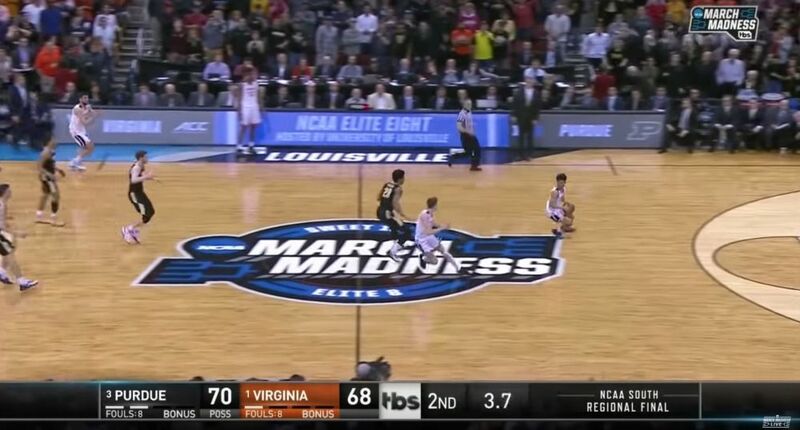 Oh, and his son Zaire re-creating his old Converse commercial before last night's game might, too. Above: Last night was Dirk Nowitzki's final home game, too. Here's another cry-worthy vid. My thought bubble: We aim at the garbage can and yell "Kobe." For Dirk, it's his signature one-legged fadeaway. 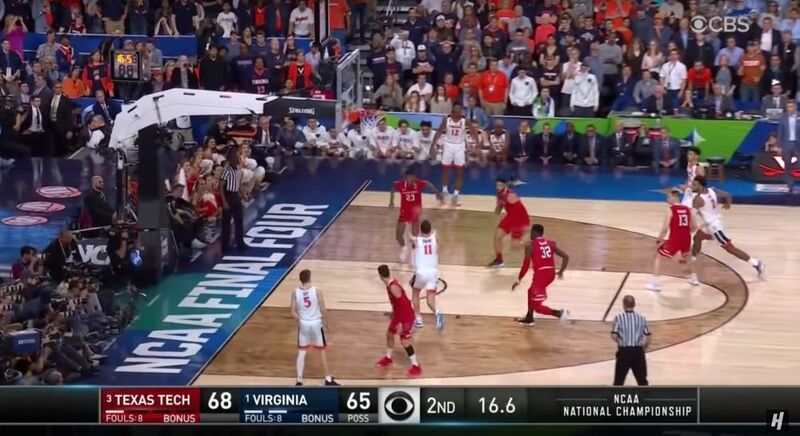 That shot will live forever. How many other players can we say that for? How many other players can you pick up a basketball right now, find a nearby hoop and proceed to imitate? It’s not many. And I think that’s pretty cool. The Champions League quarterfinal stage kicked off yesterday, with three English teams and one Portuguese team competing in first-leg action. Tottenham 1, Manchester City 0: By picking up the win while also preventing City from scoring an away goal, Tottenham has a sizable advantage going into the second leg. Yes, but: Tottenham's star striker Harry Kane left the game with an ankle injury, and manager Mauricio Pochettino fears he could be out for the season. Stunning stat: Manchester City manager Pep Guardiola has experienced tremendous success throughout his career … except when it comes to away matches in Champions League knockout games, where he is now just 6-10-10. Liverpool 2, Porto 0: Liverpool, which lost to Real Madrid in last year's Champions League Final, cruised to victory behind goals from Naby Keïta and Roberto Firmino. What's next: The other four teams are in action today, with Ajax vs. Juventus and Manchester United vs. Barcelona. Both matches start at 3 pm ET and can be previewed here. Sabrina Ionescu threw a wrench in tonight's WNBA draft when she announced this past weekend that she'd be returning to Oregon for her senior year. Jackie Young, G, Notre Dame: A do-it-all guard who can defend multiple positions with her length and play on the wing or run the point. She could be a better outside shooter (14 threes this season), but that will come with time. Asia Durr, G, Louisville: A lethal scorer (21.2 PPG) who can fill it up with the best of them. She's probably the best overall prospect, but Las Vegas might not feel comfortable pairing her with another ball-dominant guard in Kelsey Plum (No. 1 pick in 2017). Teaira McCowan, C, Mississippi State: A dominant shot-blocker and rebounder at 6-foot-7. Her offensive game is limited to the paint, but she will likely develop an outside shot as a pro (76% from the charity stripe last year, which bodes well). Mock draft: Our first round predictions for tonight (7 pm ET, ESPN2). 27 years ago today, the Pittsburgh Penguins beat the New York Rangers to extend their winning streak to 17 games, setting an NHL record that still stands today. The backdrop: A few months earlier, Pittsburgh star Mario Lemieux announced that he had been diagnosed with Hodgkin's Disease and missed 24 games to undergo radiation treatment. On March 2, he returned — and led the Penguins on this historic run. Sports, man. Fun fact: The Penguins finished the 1992–93 season with the best record in the NHL, but they fell in the Division Finals to the Islanders, the same team they play in tonight’s first round. Question: Albert Pujols passed Ichiro Suzuki on the all-time hits list this past weekend. Who was the last player Pujols passed before Ichiro? Hint: He retired in 2007, having played his entire career for the same team. The International Swimming League formally announced plans for its inaugural season yesterday, while also unveiling its four U.S.-based teams: the D.C. Trident, Cali Condors, Los Angeles Current and New York Breakers. Driving the news: Five-time Olympic champion Katie Ledecky will compete in and help promote the league, as will fellow American Olympians Nathan Adrian, Simone Manuel and Ryan Murphy. Why it matters: The ISL will give the world's top swimmers a chance to earn prize money — a rarity in the sport. It will also provide an opportunity to compete on a consistent basis, which is increasingly important with the 2020 Tokyo Olympics on the horizon. How it works: Beginning in October, the league's eight teams — four in the U.S., four in Europe — will compete for points each weekend in a series of competitions that culminate in a championship in Las Vegas a few days before Christmas. Pro tip: Download The Action Network app to master the art of sports betting. 1. Who will cover the spread in the Lightning (-1.5) vs. Blue Jackets playoff game? Know this: The Lightning have beaten the Blue Jackets in six consecutive games by a margin of 28-7, including outscoring the Blue Jackets 22-3 in their last four meetings. 2. Will Sidney Crosby score a goal in the Penguins' game against the Islanders? Know this: Entering the playoffs, Sidney Crosby has scored in his last two games — the first time he has scored in consecutive games in 14 games. In four game against the Islanders this year, he has two goals and three assists. 3. The Hornets need a win against the Magic to make the playoffs. How many points will Kemba Walker score? Know this: Walker is averaging 25.4 points per game on the season and 32.4 ppg in five games this month. Thanks for all the feedback yesterday! Super helpful.